A transformer is a static electrical device that transfers electrical energy between two or more circuits through electromagnetic induction. A varying current in one coil of the transformer produces a varying magnetic field, which in turn induces a varying electromotive force (emf) or “voltage” in a second coil. 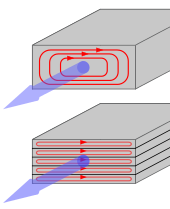 Power can be transferred between the two coils through the magnetic field, without a metallic connection between the two circuits. Faraday’s law of induction discovered in 1831 described this effect. Transformers are used to increase or decrease the alternating voltages in electric power applications. Since the invention of the first constant-potential transformer in 1885, transformers have become essential for the transmission, distribution, and utilization of alternating current electrical energy.A wide range of transformer designs is encountered in electronic and electric power applications. Transformers range in size from RF transformers less than a cubic centimeter in volume to units interconnecting the power grid weighing hundreds of tons. Referring to the two schematic models pictured below, an ideal transformer is a theoretical, linear transformer that is lossless and perfectly coupled. Perfect coupling implies infinitely high core magnetic permeability and winding inductances and zero net magnetomotive force. According to Faraday’s law, since the same magnetic flux passes through both the primary and secondary windings in an ideal transformer, a voltage is induced in each winding, according to eq. in the secondary winding case, according to eq. in the primary winding case.The primary EMF is sometimes termed counter EMF.This is in accordance with Lenz’s law, which states that induction of EMF always opposes development of any such change in magnetic field. The transformer winding voltage ratio is thus shown to be directly proportional to the winding turns ratio according to eq. (3). common usage having evolved over time from ‘turn ratio’ to ‘turns ratio’. However, some sources use the inverse definition. According to the law of conservation of energy, any load impedance connected to the ideal transformer’s secondary winding results in conservation of apparent, real and reactive power consistent with eq. (4). The ideal transformer identity shown in eq. (5) is a reasonable approximation for the typical commercial transformer, with voltage ratio and winding turns ratio both being inversely proportional to the corresponding current ratio. the apparent load impedance referred to the primary circuit is derived in eq. (7) to be equal to the turns ratio squared times the secondary circuit load impedance. Eddy current losses due to joule heating in the core that are proportional to the square of the transformer’s applied voltage. An illustration of parasitic capacitance in a transformer. The transformer model with capacitance is quite complicated, and is rarely attempted; even the ‘real’ transformer model’s equivalent circuit does not include the parasitic capacitance. However, the capacitance can be measured by comparing open-circuit inductance to a short-circuit inductance. In some applications increased leakage is desired, and long magnetic paths, air gaps, or magnetic bypass shunts may deliberately be introduced in a transformer design to limit the short-circuit current it will supply. Leaky transformers may be used to supply loads that exhibit negative resistance, such as electric arcs, mercury- and sodium- vapor lamps and neon signs or for safely handling loads that become periodically short-circuited such as electric arc welders. Air gaps are also used to keep a transformer from saturating, especially audio-frequency transformers in circuits that have a DC component flowing in the windings. A now-obsolete form of transformer called a saturable reactor exploits saturation of the core by DC-current in order to block the transformer action, thereby controlling the flow of AC current through the transformer. Knowledge of leakage inductance is also useful when transformers are operated in parallel. It can be shown that if the percent impedance and associated winding leakage reactance-to-resistance (X/R) ratio of two transformers were hypothetically exactly the same, the transformers would share power in proportion to their respective volt-ampere ratings (e.g. 500 kVA unit in parallel with 1,000 kVA unit, the larger unit would carry twice the current). However, the impedance tolerances of commercial transformers are significant. Also, the Z impedance and X/R ratio of different capacity transformers tends to vary, corresponding 1,000 kVA and 500 kVA units’ values being, to illustrate, respectively, Z ≈ 5.75%, X/R ≈ 3.75 and Z ≈ 5%, X/R ≈ 4.75. Referring to the diagram, a practical transformer’s physical behavior may be represented by an equivalent circuit model, which can incorporate an ideal transformer. Core losses are caused mostly by hysteresis and eddy current effects in the core and are proportional to the square of the core flux for operation at a given frequency. The finite permeability core requires a magnetizing current IM to maintain mutual flux in the core. Magnetizing current is in phase with the flux, the relationship between the two being non-linear due to saturation effects. However, all impedances of the equivalent circuit shown are by definition linear and such non-linearity effects are not typically reflected in transformer equivalent circuits. With sinusoidal supply, core flux lags the induced EMF by 90°. With open-circuited secondary winding, magnetizing branch current I0 equals transformer no-load current. The resulting model, though sometimes termed ‘exact’ equivalent circuit based on linearity assumptions, retains a number of approximations. Analysis may be simplified by assuming that magnetizing branch impedance is relatively high and relocating the branch to the left of the primary impedances. This introduces error but allows combination of primary and referred secondary resistances and reactances by simple summation as two series impedances. Three-phase transformers used in electric power systems will have a nameplate that indicate the phase relationships between their terminals. This may be in the form of a phasor diagram, or using an alpha-numeric code to show the type of internal connection (wye or delta) for each winding. The EMF of a transformer at a given flux increases with frequency. By operating at higher frequencies, transformers can be physically more compact because a given core is able to transfer more power without reaching saturation and fewer turns are needed to achieve the same impedance. However, properties such as core loss and conductor skin effect also increase with frequency. Aircraft and military equipment employ 400 Hz power supplies which reduce core and winding weight. Conversely, frequencies used for some railway electrification systems were much lower (e.g. 16.7 Hz and 25 Hz) than normal utility frequencies (50–60 Hz) for historical reasons concerned mainly with the limitations of early electric traction motors. Consequently, the transformers used to step-down the high overhead line voltages (e.g. 15 kV) were much larger and heavier for the same power rating than those required for the higher frequencies. Power transformer over-excitation condition caused by decreased frequency; flux (green), iron core’s magnetic characteristics (red) and magnetizing current (blue). Operation of a transformer at its designed voltage but at a higher frequency than intended will lead to reduced magnetizing current. At a lower frequency, the magnetizing current will increase. Operation of a large transformer at other than its design frequency may require assessment of voltages, losses, and cooling to establish if safe operation is practical. For example, transformers may need to be equipped with ‘volts per hertz’ over-excitation, ANSI function 24, relays to protect the transformer from overvoltage at higher than rated frequency. One example is in traction transformers used for electric multiple unit and high-speed train service operating across regions with different electrical standards. The converter equipment and traction transformers have to accommodate different input frequencies and voltage (ranging from as high as 50 Hz down to 16.7 Hz and rated up to 25 kV) while being suitable for multiple AC asynchronous motor and DC converters and motors with varying harmonics mitigation filtering requirements. At much higher frequencies the transformer core size required drops dramatically: a physically small and cheap transformer can handle power levels that would require a massive iron core at mains frequency. The development of switching power semiconductor devices and complex integrated circuits made switch-mode power supplies viable, to generate a high frequency from a much lower one (or DC), change the voltage level with a small transformer, and, if necessary, rectify the changed voltage. As transformer losses vary with load, it is often useful to tabulate no-load loss, full-load loss, half-load loss, and so on. Hysteresis and eddy current losses are constant at all load levels and dominate overwhelmingly without load, while variable winding joule losses dominating increasingly as load increases. The no-load loss can be significant, so that even an idle transformer constitutes a drain on the electrical supply. Designing energy efficient transformers for lower loss requires a larger core, good-quality silicon steel, or even amorphous steel for the core and thicker wire, increasing initial cost. The choice of construction represents a trade-off between initial cost and operating cost. Current flowing through a winding’s conductor causes joule heating. As frequency increases, skin effect and proximity effect causes the winding’s resistance and, hence, losses to increase. Magnetic flux in a ferromagnetic material, such as the core, causes it to physically expand and contract slightly with each cycle of the magnetic field, an effect known as magnetostriction, the frictional energy of which produces an audible noise known as mains hum or transformer hum. 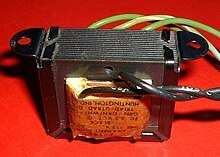 This transformer hum is especially objectionable in transformers supplied at power frequencies[o] and in high-frequency flyback transformers associated with television CRTs. Leakage inductance is by itself largely lossless, since energy supplied to its magnetic fields is returned to the supply with the next half-cycle. However, any leakage flux that intercepts nearby conductive materials such as the transformer’s support structure will give rise to eddy currents and be converted to heat. Closed-core transformers are constructed in ‘core form’ or ‘shell form’. When windings surround the core, the transformer is core form; when windings are surrounded by the core, the transformer is shell form. Shell form design may be more prevalent than core form design for distribution transformer applications due to the relative ease in stacking the core around winding coils. Core form design tends to, as a general rule, be more economical, and therefore more prevalent, than shell form design for high voltage power transformer applications at the lower end of their voltage and power rating ranges (less than or equal to, nominally, 230 kV or 75 MVA). At higher voltage and power ratings, shell form transformers tend to be more prevalent. Shell form design tends to be preferred for extra-high voltage and higher MVA applications because, though more labor-intensive to manufacture, shell form transformers are characterized as having inherently better kVA-to-weight ratio, better short-circuit strength characteristics and higher immunity to transit damage. Power transformer inrush current caused by residual flux at switching instant; flux (green), iron core’s magnetic characteristics (red) and magnetizing current (blue). Transformers for use at power or audio frequencies typically have cores made of high permeability silicon steel. The steel has a permeability many times that of free space and the core thus serves to greatly reduce the magnetizing current and confine the flux to a path which closely couples the windings. Early transformer developers soon realized that cores constructed from solid iron resulted in prohibitive eddy current losses, and their designs mitigated this effect with cores consisting of bundles of insulated iron wires. Later designs constructed the core by stacking layers of thin steel laminations, a principle that has remained in use. Each lamination is insulated from its neighbors by a thin non-conducting layer of insulation. The transformer universal EMF equation implies an acceptably large core cross-sectional area in order to avoid saturation. One common design of laminated core is made from interleaved stacks of E-shaped steel sheets capped with I-shaped pieces, leading to its name of ‘E-I transformer’. Such a design tends to exhibit more losses, but is very economical to manufacture. The cut-core or C-core type is made by winding a steel strip around a rectangular form and then bonding the layers together. It is then cut in two, forming two C shapes, and the core assembled by binding the two C halves together with a steel strap.They have the advantage that the flux is always oriented parallel to the metal grains, reducing reluctance. A steel core’s remanence means that it retains a static magnetic field when power is removed. When power is then reapplied, the residual field will cause a high inrush current until the effect of the remaining magnetism is reduced, usually after a few cycles of the applied AC waveform. Overcurrent protection devices such as fuses must be selected to allow this harmless inrush to pass. On transformers connected to long, overhead power transmission lines, induced currents due to geomagnetic disturbances during solar storms can cause saturation of the core and operation of transformer protection devices. Powdered iron cores are used in circuits such as switch-mode power supplies that operate above mains frequencies and up to a few tens of kilohertz. These materials combine high magnetic permeability with high bulk electrical resistivity. For frequencies extending beyond the VHF band, cores made from non-conductive magnetic ceramic materials called ferrites are common.Some radio-frequency transformers also have movable cores (sometimes called ‘slugs’) which allow adjustment of the coupling coefficient (and bandwidth) of tuned radio-frequency circuits. Toroidal transformers are built around a ring-shaped core, which, depending on operating frequency, is made from a long strip of silicon steel or permalloy wound into a coil, powdered iron, or ferrite. A strip construction ensures that the grain boundaries are optimally aligned, improving the transformer’s efficiency by reducing the core’s reluctance. The closed ring shape eliminates air gaps inherent in the construction of an E-I core.The cross-section of the ring is usually square or rectangular, but more expensive cores with circular cross-sections are also available. The primary and secondary coils are often wound concentrically to cover the entire surface of the core. This minimizes the length of wire needed and provides screening to minimize the core’s magnetic field from generating electromagnetic interference. A physical core is not an absolute requisite and a functioning transformer can be produced simply by placing the windings near each other, an arrangement termed an “air-core” transformer. The air which comprises the magnetic circuit is essentially lossless, and so an air-core transformer eliminates loss due to hysteresis in the core material. The magetizing inductance is drastically reduced by the lack of a magnetic core, resulting in large magnetizing currents and losses if used at low frequencies. A large number of turns can be used to increase magnetizing inductance, but doing so increases winding resistance and leakage inductance. Air-core transformers are unsuitable for use in power distribution. They have however very high frequency capability, and are frequently employed in radio-frequency applications, for which a satisfactory coupling coefficient is maintained by carefully overlapping the primary and secondary windings. 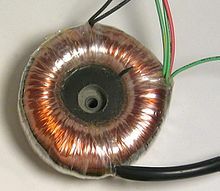 Air cores are also used for resonant transformers such as Tesla coils, where they can achieve reasonably low loss despite the low magnetizing inductance. Cut view through transformer windings. Dry-type transformer winding insulation systems can be either of standard open-wound ‘dip-and-bake’ construction or of higher quality designs that include vacuum pressure impregnation (VPI), vacuum pressure encapsulation (VPE), and cast coil encapsulation processes. In the VPI process, a combination of heat, vacuum and pressure is used to thoroughly seal, bind, and eliminate entrained air voids in the winding polyester resin insulation coat layer, thus increasing resistance to corona. VPE windings are similar to VPI windings but provide more protection against environmental effects, such as from water, dirt or corrosive ambients, by multiple dips including typically in terms of final epoxy coat. The conducting material used for the windings depends upon the application, but in all cases the individual turns must be electrically insulated from each other to ensure that the current travels throughout every turn. For small power and signal transformers, in which currents are low and the potential difference between adjacent turns is small, the coils are often wound from enamelled magnet wire, such as Formvar wire. Larger power transformers operating at high voltages may be wound with copper rectangular strip conductors insulated by oil-impregnated paper and blocks of pressboard. White: Air, liquid or other insulating medium in conjunction with varnish, paper or other coil insulation. Green spiral: Grain oriented silicon steel. Black: Primary winding (Aluminum or copper). Red: Secondary winding (Aluminum or copper). Cutaway view of liquid-immersed construction transformer. The conservator (reservoir) at top provides liquid-to-atmosphere isolation as coolant level and temperature changes. The walls and fins provide required heat dissipation balance. Small dry-type and liquid-immersed transformers are often self-cooled by natural convection and radiation heat dissipation. As power ratings increase, transformers are often cooled by forced-air cooling, forced-oil cooling, water-cooling, or combinations of these.Large transformers are filled with transformer oil that both cools and insulates the windings.Transformer oil is a highly refined mineral oil that cools the windings and insulation by circulating within the transformer tank. The mineral oil and paper insulation system has been extensively studied and used for more than 100 years. It is estimated that 50% of power transformers will survive 50 years of use, that the average age of failure of power transformers is about 10 to 15 years, and that about 30% of power transformer failures are due to insulation and overloading failures. Prolonged operation at elevated temperature degrades insulating properties of winding insulation and dielectric coolant, which not only shortens transformer life but can ultimately lead to catastrophic transformer failure. With a great body of empirical study as a guide, transformer oil testing including dissolved gas analysis provides valuable maintenance information. This underlines the need to monitor, model, forecast and manage oil and winding conductor insulation temperature conditions under varying, possibly difficult, power loading conditions. The tank of liquid filled transformers often has radiators through which the liquid coolant circulates by natural convection or fins. Some large transformers employ electric fans for forced-air cooling, pumps for forced-liquid cooling, or have heat exchangers for water-cooling.An oil-immersed transformer may be equipped with a Buchholz relay, which, depending on severity of gas accumulation due to internal arcing, is used to either alarm or de-energize the transformer.Oil-immersed transformer installations usually include fire protection measures such as walls, oil containment, and fire-suppression sprinkler systems. Polychlorinated biphenyls have properties that once favored their use as a dielectric coolant, though concerns over their environmental persistenceled to a widespread ban on their use. Today, non-toxic, stable silicone-based oils, or fluorinated hydrocarbons may be used where the expense of a fire-resistant liquid offsets additional building cost for a transformer vault. PCBs for new equipment were banned in 1981 and in 2000 for use in existing equipment in United Kingdom Legislation enacted in Canada between 1977 and 1985 essentially bans PCB use in transformers manufactured in or imported into the country after 1980, the maximum allowable level of PCB contamination in existing mineral oil transformers being 50 ppm. Construction of oil-filled transformers requires that the insulation covering the windings be thoroughly dried of residual moisture before the oil is introduced. Drying is carried out at the factory, and may also be required as a field service. Drying may be done by circulating hot air around the core, by circulating externally heated transformer oil, or by vapor-phase drying (VPD) where an evaporated solvent transfers heat by condensation on the coil and core. The VPD process most often uses kerosene as the heat exchanging fluid. In addition to decreasing the moisture content in the insulation, the kerosene acts as a cleaning solvent which takes out any dust and dirt from the insulation surfaces. Compared to a conventional hot air drying process, the vapor-phase drying process decreases the drying time by 40% to 50%. For small transformers, resistance heating by injection of current into the windings is used. The heating can be controlled very well, and it is energy efficient. The method is called low-frequency heating (LFH) since the current used is at a much lower frequency than that of the power grid, which is normally 50 or 60 Hz. A lower frequency reduces the effect of inductance, so the voltage required can be reduced. The LFH drying method is also used for service of older transformers.